You might come up with a few theories as to why Finland has earned the title of world's happiest country for two years in a row. Maybe it's the fact that there's stunningly beautiful nature awaiting you around every corner there. 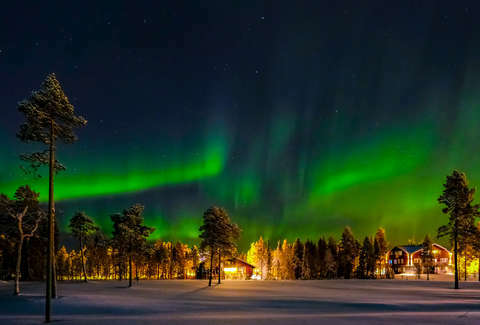 At least, that's what many Finns chalk it up to and now the country's tourism board is hoping to introduce outsiders to the nordic nation's sprawling countryside by flying in a few lucky people and having locals show them around. To help celebrate the fact that the country has once again been deemed the world's happiest by the United Nations World Happiness Report, Finland's tourism board has just introduced what it's calling the "Rent A Finn" contest, which will fly in and a handful of lucky travelers and match them with local hosts to help them "connect with nature and find their calm." Bring on the calm, please. To help reveal the Finnish secret to happiness to outsiders, eight different locals have signed up to be "happiness guides" and will each host chosen travelers for three days to do the sort of things they typically do to experience nature. That could range from visiting a national park and fishing at a summer cottage, to berry picking in the wilderness and enjoying a proper Finnish sauna. The experiences are each curated by the hosts themselves to provide a true and authentic local perspective and you can browse the full lineup of hosts to get a better sense for what sort of activities are in the mix. Although there are limited spots, the contest is open to solo travelers, families, and even groups of friends, and whoever gets chosen will have their flights and accommodations paid for by Finland's tourism board. To put yourself in the running to win a spot, you just need to film a short video about yourself, your connection to nature, and why you'd like to visit Finland and submit it with the entry form before April 14. Then, the organizers will sort through them to select winners, then work with them to arrange their trip at some point between June and August. And, if you do end up scoring one of the coveted few spots and later decide Finland is the place you need to be, may we suggest considering this spectacularly calming housing option.